To Dog With Love: Does Your Dog Shred Paper? Was your dog born with the paper shredding gene? Ask most any Havanese owner and they'll tell you their pups love to shred. Paper shredding is rather amusing, until you have to clean it up. But it also can be dangerous if your dog swallows large amounts of paper. Rocco seems to be a purist, enjoying the sport of shredding rather than consuming it. But I still think it would be fun to train him to retrieve paper instead of shredding it. Take it off the toilet paper holder, but place it high enough so your pup can't reach the loose roll (clearly I forgot to do that!). Or simply keep the bathroom door closed! Perhaps most importantly, as a new puppy owner I am constantly reminded that Rocco should never be left unsupervised, even for a moment. He enjoys his comfy crate and it's the perfect place to let him safely rest while I'm occupied with other things. Do you have a good solution for paper shredding? haha! The first time Rocco discovered toilet paper he took the end and wrapped it all the way around the house. It was pretty funny. Then he discovered the cardboard roll too. So much fun in one paper package! Wow, I'm glad i don't have a paper shredder. How can you be mad at that face though? Exactly! Rocco is way too loveable! My guys loved to shred as puppies but outgrew it. Keeping pups crated when you can't be interacting with them is the best preventative. I kept both crated until the one year mark. They had been potty trained for many months at that point, but experiments with freedom kept resulting in household damage ;-) A year seemed to be the cut-off for when reliable, trustworthy behavior kicked in. Of course, the good behavior required a good bit of vigorous exercise first! Well, I have never thought of shredding the toilet paper! And it is there, all day, for the taking! I just like to shred wrapping paper...you know, when it is wrapped around one of my gifts. It's a good talent to open gifts quickly! LOL! Great post! Your info and pics are perfect. Your pup is too cute. Have a Wonderful Wednesday! Thank you! Rocco is turning into quite the character. haha! Romeo shreds toilet paper, tissue paper, bubble wrap, cardboard. He will even jump up on the toilet seat to reach the toilet paper that is now on the counter. So I try to remember to keep the door closed. It is definitely a Havanese trait. But look at Rocco's face. You just have to love him, he thinks interior design is his job and he is so proud of himself. Oh my! DEFINITELY a Havanese thing! Rocco IS a specialist at creating an environment that is comfortable for him! We must work on putting away toys next. I don't shred the TP, but give me a gift to unwrap and I am all at it!!! :-D Aw, Rocco is a pup after my own heart!! I love to shred, shred, shred...I just haven't tried toilet paper out yet (I leave that for the cats to shred)! I'll take anything: tissues, magazines, bills (she doesn't seem to mind that one)! Even though I have plenty of toys and a kong, I'll still shred if left alone, so that means that any paper product must be out of reach at all times! Hehehe! Awww. Rocco is so darned cute that he can come and paper my house any time he likes! Wow. That looks like fun. I'm gonna have to give shredding a try. One day I was walking downstairs and our saw our puppy walking from the family room to the living room with a roll of TP in his mouth. Hilarious. I explained that it was naughty and he stopped. Now we give our dogs small boxes to shred up when it's raining outside then clean it up when they're finished. My cat bro Bert does that when mom is late coming home to feed him...he shreds the toilet paper in the half bath several times a week! That's the cutest paper shredder I have ever seen. Great capture! LOL Jasmine certainly was born with that gene. She just couldn't resist shredding any paper she could get her paws on. She did grow out of it, though. JD is missing that gene, he'd rather shred his bed instead. Dakota will soon be 6 yrs old and STILL shreds paper! He doesn't shred toilet paper because he isn't permitted in the bathrooms but if there is a stray letter or whatever in the living room he is ON IT! Lol - that is too cute. It reminds me of our sheltie we had when I was a kid. 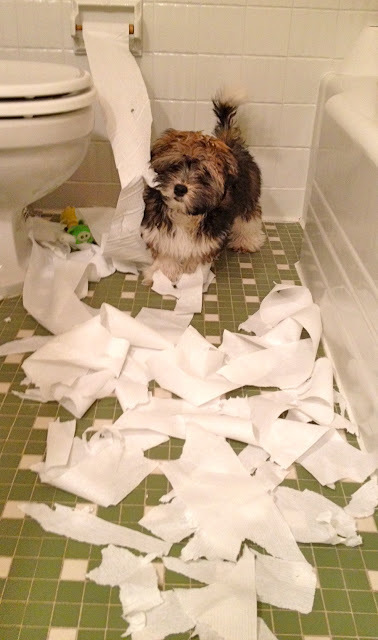 When she was a puppy, we would sometimes come home to a house of shredded toilet paper rolls. Really cute photos. Besides shredding my toys paper is my next favorite thing...especially the mail. OOooooohhhh, I am becoming more and more convinced the Felix is part Havanese. You can't keep that boy off the paper. Ohmiwoof, son't cardboard out either. I don't know how you could ever refuse that adorable little Rocco face. He's so precious. We are working on a video for a non-profit organisation, and we would love to use this one of your pictures of 'the artist... at work'. Can you please confirm us we can use your images? Our video will be used in Europe only, and in a very animal friendly context! The Best Paper Shredders are those that can fit consistently into different destroying environment without much ado and exacerbation. The order of best shredder fluctuates from association to association and includes advanced choice making. Destroying machines contrast in size, cut sort, cut size, security level, container size, and the level of robotization gave in a machine. Our havanese Chester loves shredding paper. The sound of him ripping it is so cute but after he gets his paws on it it can be hard to get back. good information thanks for sharing this post.